This picture doesn’t do it justice, but a lot of our drives look something like this. The feed bunk in one of our heifer lots is so muddy that the animals can barely make it to the bunk anymore, so we borrowed a feed wagon from a neighbor to feed them else where in the pasture. 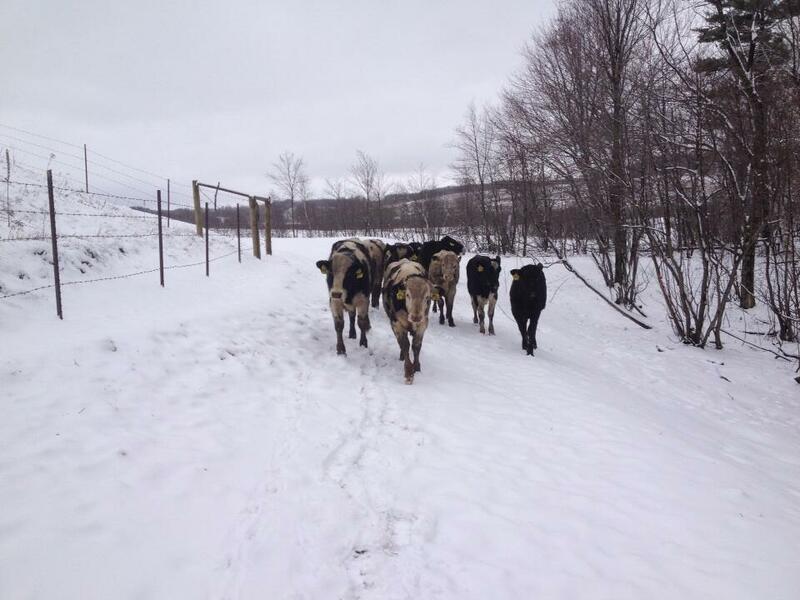 I stole this picture from Theo as he leads them to the new feed location with a grain bucket. 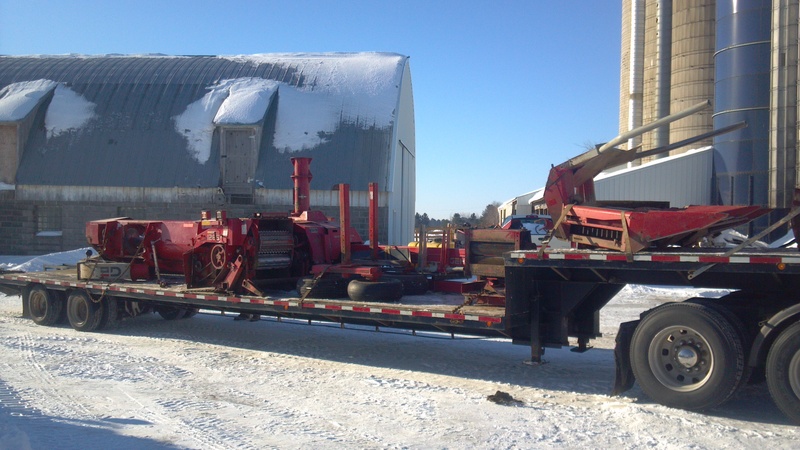 Sold our old choppers, here is one of them on a truck getting hauled to Indiana. New one is supposed to be here in the next week or so. 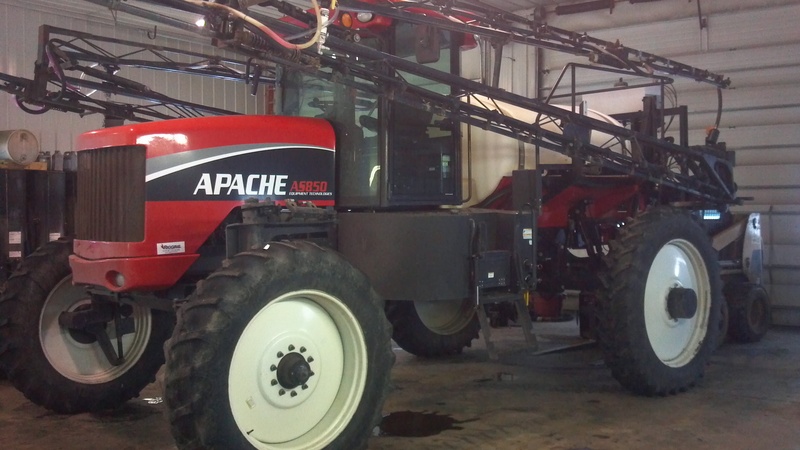 Dave also upgraded his sprayer a little bit this winter. Should be able to cover some acres with this thing! Also going to use it to split our nitrogen application on our corn. 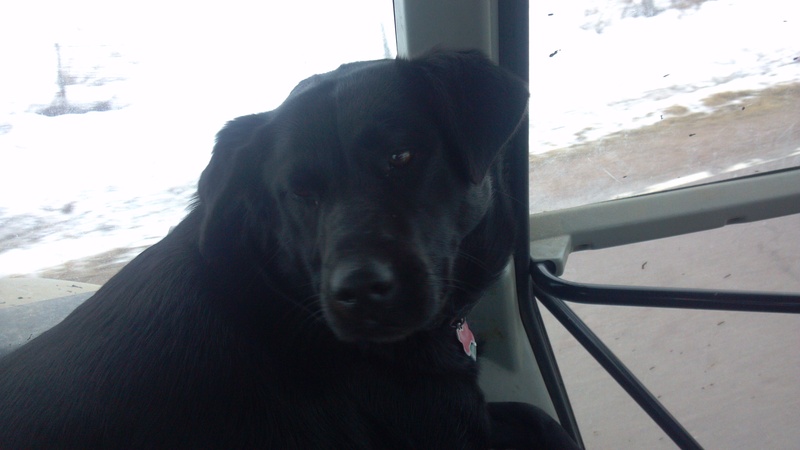 Here’s my dog Sophie riding with me in the tractor on the way to pull the feed mixer tractor through the mud at the heifer lot mentioned above. She isn’t a big fan of jumping up into the noisy tractor, but doesn’t like being left behind! One in, she usually just sits on the buddy seat next to me. 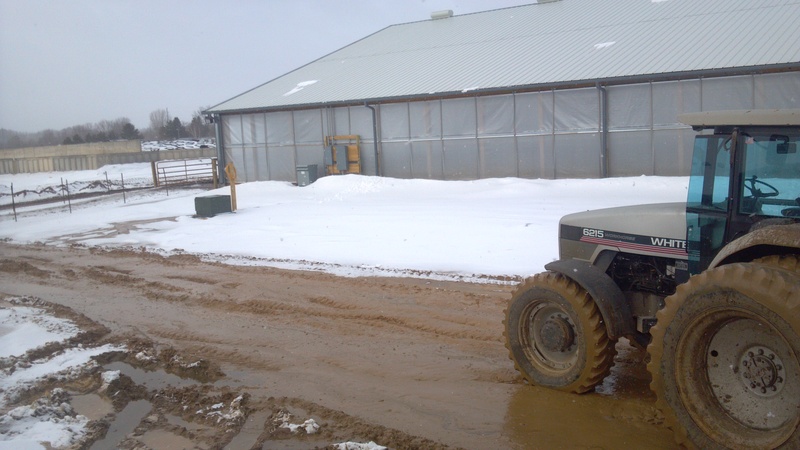 Hopefully soon I can post about getting into the fields, but as I type this, it is snowing again… Bah humbug. This entry was posted in Agronomy, Animals, General Information, Machinery and tagged agco, agriculture, agronomy, Animals, baby animals, corn, cows, dairy cows, dairy farm, dairy farming, dairy farming today, factory farming, family farm, family farming, farm, farm animals, farmer, farmers, farming, food production, loveable mutt, Modern Agricuture, modern farming, organic farming, pets, production agriculture, sustainable agriculture, sustainable agricuture, tractors, Wisconsin dairy farming. Bookmark the permalink.